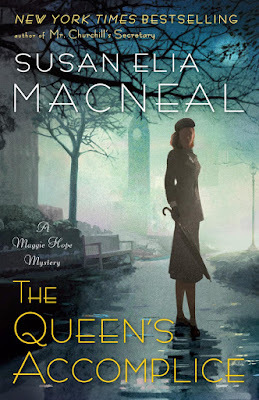 SUSAN ELIA MACNEAL: It’s summer, and I’m desperately trying to balance family time and working on THE PARIS SPY (Maggie Hope #7). This basically consists of taking my computer on our family vacations to Hudson, NY and Providence, RI. So far I’ve worked — and missed going on a water park adventure, a hike, to a horse show, and a barbecue. And I've also played hookey from work (don’t tell my editor!) — to go to the horse stables to watch kiddo, have a lunch date at an amazing French place with my husband, and go swimming with all the kids and then take a nap in a hammock. I think the solution is to be fully present in whatever mode I’m in — family or work— but it’s hard. This summer, especially, I seem to be struggling. Whenever I’m doing one, I’m worrying about what I’m missing on the other side. There’s just always this feeling of not having enough time. I don’t know that there’s a solution to this work/life dilemma. But I have been lucky enough to have a loyal writing buddy, Zola, on this leg of the vacation. She’s an elderly black lab mix who likes to curl up and sleep near me as type. When her family's around, she loves them. And when they're gone, she naps (her "work"). I love her. “Be like Zola” is perhaps the wisest thing I’ve come up with so far. It's my new mantra. Spy and code-breaker extraordinaire Maggie Hope returns to war-weary London, where she is thrust into the dangerous hunt for a monster, as the New York Times bestselling mystery series for fans of Jacqueline Winspear, Charles Todd, and Anne Perry continues. And the first review, from Kirkus, lauds THE QUEEN'S ACCOMPLICE: "Maggie ... is a thoughtful spy whose dangerous escapades never disappoint." Thank you! To celebrate, I’m giving away an autographed ARC to one lucky reader, who posts in the comments. In the meantime, here's the prologue of THE QUEEN'S ACCOMPLICE. Enjoy! They were blowing in from the east now, Vera Baines noted, from the East End. Even though the air raids had stopped for the moment in London—as Hitler turned his attentions toward Russia—the docks, railroads, and factories were still burning. Through her open bedroom window, she could smell cold wind scented with smoke and destruction. She watched as it ruffled the bare black branches of the trees of Regent’s Park, rustling dead ivy. Since the war had begun, the park had become a desolate expanse of meandering walkways, overgrown shrubbery, and long air-raid trenches—an ideal location for crime. But not on her watch. As an ARP warden for her section in Marylebone, Vera Baines knew not only the winds but the intricacies of light and dark. Sunset in London in late March 1942 arrived after six, but the violet shadows began to lengthen at least an hour earlier. This evening’s sunset was extraordinary—bright red, with crepuscular rays piercing wispy clouds. Despite barely clearing the five-foot mark and a slight figure, at eighty-three, Vera was a redoubtable woman. She was more wiry than frail, her energy giving the impression of her being much taller than she actually was. She had impeccable posture and moved with a force and confidence her friends and family hadn’t seen since her husband died ten years ago. And her face, with its high cheekbones and clear blue eyes that missed nothing, radiated strength. Vera hated the war, hated the loss of innocent lives—but she couldn’t deny it had brought a certain clarity to her existence. As an ARP warden, she now felt she had a purpose: She would protect her own. As she surveyed the park’s deepening shadows from the window of her bone-colored Georgian terraced house, Vera felt responsibility, plus a fierce sense of love and pride. This was her London. These were her people. Nothing would happen to them on her sentry. It was time to begin her shift. Vera took one last look at the fad- ing light, listening to the forlorn cries of the birds, then picked her way downstairs, leaning on the railing. At her door, she put on her ARP tin hat, dark blue wool overcoat, and gloves, and reached for her walking stick—with a silver British bulldog on the handle. Then she went down the outside stairs and onto the icy flagstone pavement, bracing herself against the wind. She paced the street with her usual vigor, the pale symmetrical Nash architecture reflecting the last light of the dying sunset. The temperature was dropping and the air smelled of imminent storms. A passing white-haired man tipped his black bowler hat, and she nodded in return. “Oh, Mr. Saunders—” she called after him, her breath making clouds in the chill air. She strode on, chin high, taking her usual route past the charred remains of Regent’s Park’s brick wall. The last of the sun’s light melted away, but Vera didn’t mind the dark; she liked being out alone at night. Without electric lights to pierce the darkness, the nighttime took on a new beauty in the icy bright moonlight. Her shuttered flashlight illuminated the strips of white paint on the curbs and tree trunks, giving off a ghostly glow. In the distance, she could hear the sounds of the city: the faint rumble of motor traffic, the clip-clop of horses’ hooves on cobble- stones, the screeches and flaps of bats off to their night’s hunt. The wind picked up once again, causing the ancient tree branches to sway and creak, the dead leaves and lipstick-stained cigarette butts in the gutters to dance. Without artificial light, Regent’s Park at night could have been any era in London—from the time when ancient Britons painted themselves blue, to the reign of Queen Elizabeth I, to the period of Victoria and Albert. Even the clocks obliged: When the Nazi bombs exploded, all nearby timepieces ceased to function, paralyzed at whatever time they were at the instant of impact. These comatose clocks were another reason Vera could imagine time telescoping—the suspended present creating an atmosphere where time travel seemed no mere fantasy. Really, anything seemed possible, especially in the shadows of night. It even smelled as it could have hundreds of years ago—the same stink of urine against the crumbling brick walls as there would have been in Pepys’s day. In the darkness, Vera tripped and nearly fell, saved only by her trusty walking stick. “What the—?” she muttered, her grip in leather gloves tight on the silver handle. She righted herself, glad Mr. Saunders hadn’t been there to see. She looked down at a long blanket-wrapped bundle. Leaning over, flashlight in one hand, she lifted and pulled back the wool covering with the tip of her cane. Vera gave a sharp inhale, but didn’t cry out when she saw the butchered body of a young woman. The body looked to have be- longed to a girl in her early twenties—healthy and athletic, hair curled. Her throat had been slashed so savagely her head was nearly severed from her body. Her belly had been slit through her ATS uniform, which was soaked through with blood. Vera lifted her chin, squared her shoulders, and deployed the stiff upper lip she’d perfected over a lifetime of practice. “Yes, yes, of course I am,” she reassured him. “But I’m afraid she isn’t,” she added, pointing to the woman’s mutilated body with the silver tip of her walking stick. “What are you going on about, young man?” Despite her occasional daydreams—or night dreams—Vera had no patience for macabre nonsense. But the boy was looking past her to the park’s brick wall, gaping at lettering. With a shaking hand, Vera raised her flashlight. The words scrawled across the wall were painted the same ghostly, glowing white paint as the curbs. They read, JACK IS BACK. SUSAN ELIA MACNEAL: Reds and readers, what do you do when you're feeling town in two (or more!) directions in life? Please remember to leave a comment to be in the running for the ARC giveaway of THE QUEEN’S ACCOMPLICE. I don't think there's an easy answer when you're feeling pulled in different directions at the same time, but this is often the way life unfolds . . . it’s definitely a balancing act. I’d always opt for the important family stuff first and then fit the rest in even though that sometimes left me working late at night just to keep up, but I figured it was worth it in the end. Thanks for the introduction to “The Queen’s Accomplice” . . . now that I've read the prologue, I can’t wait to read the rest of the story. . . I love the great review! And now I’m wondering if the Kiddo has come up with a good reason for allowing eleven-year-olds to drive? Thanks for the excerpt from “The Queen’s Accomplice”, Susan. That is a hard question to answer for sure. For authors and some other professions, firm deadlines cannot be avoided (without consequences), so having to do work while on a family vacation is a necessity. But being a total workaholic is not healthy for anyone, so choosing the right moments to be with family/friends vs. staying plugged into the keyboard (meeting deadlines/commitments) is key. So working on this blog while in the backseat of the car listening to the Kiddo's conversations sounds good. And I never learned how to drive a car, so not sure if that's a boy thing wanting to drive at age 11?! What a gripping scene, Susan. Thank you for sharing it with us! I already love Vera. And I remember my own boys, now in their late twenties, lobbying hard at that age to drive the car in the driveway. I make lists when I'm torn. Always lists. It makes me feel like I have just a little bit of control. I hope you keep finding the balance! A dress made from silk escape maps given to RAF soldiers in WW2 to help them find a route out of enemy territory. The article says they made the maps on silk because it was lightweight and easy to conceal on the soldier's body. Wow. Grace, my middle daughter wanted to drive from the time she was eight. Every year, at the top of her long Christmas list: "a car". Kiddo sounds just like my 11-year old grandson. He is also a good question asker! Boy oh boy does your summer sound like mine -- trying to write, trying to be part of the family. LOVE this opening. I'm there. And I want to turn the page and read on. So excited to read The Queen's Accomplice! Really enjoyed the book set in Washington and the British/American contrasts (and similarities!) and Maggie's continued independent career. Happy sigh. When it's work vs. life, I've learned the hard way to opt for life. Work will pretty much always be there, even if it gets mad at you, but life doesn't wait around. As a faithful and devoted (okay, a little obsessed!) reader, do I want you working all the time? Heck no! Will I wait a bit for your books so you can have a life and recharge? Heck, yes! I know we've discussed on this blog how critical it is to get out of the rut and do something different when it comes to any kind of creativity. So if your editors are snippy, throw Lin-Manuel Miranda's vacation in their face and have some fun, already! With love kiddo! And Zola! And books especially mysteries. Well, that's a page-turner from the very start. Can't wait for its release. To answer your question, when I am torn in different directions, I consciously start allocating time between them - even resorting to using a timer if necessary. I find after a little while of doing that, things seem to flow back into a more natural rhythm. Of course, it is usually that I am avoiding work and playing too much. That's why a timer is handy - it keeps me focused knowing there is an end in sight. Great opening, Susan--scared the pants off me, BTW! That work/life balance--I'm with Joan and Grace--sometimes you have to choose your moments and not let them pass by--and, like, Edith, I find making lists helps--as does breaking 'work' down into manageable chunks of effort so it's not this overwhelming weight on my mind all the time. That and burning the midnight oil! I live out in the country, and when my nephews were about 14 (not 11, Kiddo--some 11-year-olds still aren't tall enough to see over the steering wheel! ), I took them out on the back roads and the local cemetery with its winding lanes and taught them to drive--let them get the feel for handling a car, stay in their lane even when it isn't marked, stopping at a stop sign, making left and right turns, getting up to speed when they were confident enough. My son - now 14 - has been asking why he can't drive for years. "But I'm tall enough to reach the pedals. And I know how a car works." Well, sorry dear. Pennsylvania says not yet. Love this opening, Susan. How perfectly eerie and you hit all the right notes with character and atmosphere. Balancing? When I figure it out I'll let you know (wow, typing without a pinky is hard - ripped off the nail and the bandage is not convenient). Thank you for all the kind words, friends. Re: the opening, the character of Vera was meant just for this bit, but I loved her so much (and she was so insistent) she became a pivotal character in the book! First, wow, what a start! Great opening. I think you've hit on the only thing you can do, try to be fully in the moment of whatever you're doing. I used to wait for that perfect time - when the kids are older, when work slows down, when something, but now in my wise older years, or at least my older years, I've realized that will never happen. So just do what you need to do and try not to stress about what you're not doing. I thought when I retired I would just sit out by the pond and sip lemonade and catch up on all the books on my shelves. However, life stepped in, health problems, other things to be taken care of, an adult daughter with health problems here for a long visit, so sometimes my appointments scheduling and other tasks seems like I still have a job. I just rely on scheduling time for everything including family fun as best I can, and when it doesn't work say oh well, tomorrow is another day. Ha, yeah, our two youngest learned to drive a Jeep (that wouldn't get out of first gear) on a friend's farm, too. I think they were eight and eleven, and the friend's sons were about nine and ten. Clearly, only the dad's were present. Working from home is nothing but compromise, no matter what. I used to tell my girls to play quietly and don't disturb me for the next hour unless the house was on fire, or someone was gushing bodily fluids. And they'd better not cause either situation. It was the only way to write then, since my husband was out of state for almost that entire year. Love this series! And I'd really like to win this latest book. Vera sounds like someone I would want to know, so I'm glad you kept her! I'm a list maker, like some others here. I started out with mental to- do lists as an adolescent. Now I create written lists, as needed. But there is nothing formal about them. Many are just scribbled on a piece of scrap paper I leave out on the bathroom sink at bedtime; others may make it into the car in the morning. It took me years to realize that it's okay to not get to everything on the list. Some things, such as family needs that crop up take precedence over everything else. Oh, and Susan, I've been reading the Maggie Hope books since the first one came out. A few months ago a friend emailed me that she had just discovered a great series set during WW II, and asked if I had heard of the Maggie Hope books. "Yes! ", I said, and told her she would love the series. She, too, is eagerly waiting for the next one. Yes, a busy life can be stressful but what a lovely way to be stressed! I think it's your wonderful imagination that keeps your brain busy! Take time to follow Zola's example and hit the hammock! As always, remember to breathe! I find I wake really early on vacation, take my laptop to sit at the window, admire the view, and write. I can get quite a lot done before husband and/or family wakes up. Oh, I'm glad you all like Vera — seriously, I adore her and she may be back for more books! Mary Sutton, hope your pinky finger heals quickly! P.S. Rhys, Kiddo gets up at 6, so I'm not sure I'm up for a 4 a.m. call time.... How easy you make it sound, though. Your books give us something wonderful to look forward to. Your writing doesn't show any struggle with balancing work/family. Sharing your personal life with us is an act of trust that I've admired. Thank you for that, too. You have a full life. Enjoy it! As always, missing Miz Edna. Anticipating the new book so much. I need many distractions in order to get thru the rest of this summer Now please pick me to win the ARC. Oh Susan. When you find the answer to that let me know. At least all your directions are pleasant ones! I think my husband learned to drive an old jeep when he was about ten and his family was living in a mining camp in the Yucatan. I do believe this urge to drive early is a guy thing. I never had to urge to even try a go-kart. Even bumper cars seemed beyond my capabilities. As for being pulled in different direction, I guess go with the strongest pull for a while until another one takes over. Perhaps one can achieve balance bouncing back and forth. The idea makes me dizzy. I loved the excerpt and the cover is outstanding! Can't wait to read Maggie's latest. Way to provide a sneak peek, Susan! JACK IS BACK -- great hook! Airieanne, yes, Miss Edna! We were just toasting her, thinking of how much she'd enjoy this vacation, Kiddo driving her around on the golf cart, the adorable kids, all the good outdoor grilling.... We all miss her so much. It sounds like you have been able to maintain a good balance between writing and being with your family this summer, though I know that it must be hard to have to choose sometimes. Loved the golf cart story. My daughter started driving a golf cart at around the same age as your son, and it certainly made her feel like she was qualified to move on to a real car. The good news, when we started letting her drive our cars, she was not nervous and had the basics down and was basically a good driver. They grow up so fast -- now my 10 year old is an 18 year old and I still can't get used to seeing her driving her Jeep! I can not wait to read The Queen's Accomplice. It sounds so interesting. Thanks for sharing. I have been trying so hard to get to Bouchercon attending authors whom I haven't yet read this summer. I've even delayed my reading of your ARC and two other ARCs that are coming out in October, and all three of these are by favorite authors, so it has been a test of my will for sure. Normally, I would tear into any of those ARCs as soon as I receive them. I have promised myself if I follow my plan until August, then I can read The Queen's Accomplice, my treat for being good. Susan, you are making this plan near impossible with the excerpt today. Oh, I do love Maggie Hope so, and now Vera Baines! Your writing, Susan, is so beautiful that I immediately get lost in it. Your descriptions are just delicious. As to Mattie wanting to drive. I'm glad I'm not in charge of that, because that boy has me loving his sweet, amazing self. I'd probably let him do most anything he asked. You and Noel are raising such an interesting, lovely boy. Kudos to you both. Oh, and I was much taken with your use of "crepuscular" in "crepuscular rays." After looking it up (I love that I still have to look up words), I now have a new word to apply to the deer that make driving a bit stressful at times. Using the second application of its definition, I can say that the crepuscular nature of the deer make me especially cautious. Yes, this is lots of fun for me. Hehehe! OHHHH I can't wait for the release. This will be a fantastic addition to an awesome series. You make it look so easy, Susan. Taking us back in time as if we were there. Really enjoy your books, can't wait for this one to debut. Enjoyed the excerpts immensely. As to not enough time issue-2 thoughts. Schedule yourself to the hilt. This rarely works for a creative person. After years of trying variations on this scheduling theme I've landed on focusing on a single task for a day.You may not finish task in a day but there is always tomorrow for larger tasks. Admittedly family time disrupts tasks but that's when rubber time clocks come in handy. As the othere postings state, I love this excerpt and cannot wait to read the rest of Maggie's next adventure! When I'm torn between work and home, I take lots of deep breaths and try to find a quiet spot to sort myself out. Focusing on a piece of art on either my office or bedroom wall helps, too. The introduction to Vera Baines is wonderful - I'm hoping things go well for her! I have a weakness for older ladies in novels. I'll be looking for the book in November. It's already on my list. I wish I paid more attention to the "to-do" lists I make - I might keep up with things better. I don't ever recall wanting to drive when I was young - what I do recall is my mother saying she couldn't wait for me to get a license so she'd never have to go grocery shopping again. The two are probably related. Thanks to Edith for posting the link to the silk map dress article. oops. Anonymous with the husband/child learning to drive a jeep in the Yucatan was me. My screen was really wonky this morning. I like Vera too. If it's any consolation, Kathy, I only learned "crepuscular" in the last few years. Still learning new words! I love them so! OH Maggie, how I've missed you! Maggie and Vera are going to get along, I can tell. I can hardly contain the anticipation. Susan, you amaze me whenever I hear of all you manage to do with the limited time we humans have available. And it sounds like you and Noel are doing a wonderful job raising Kiddo. He seems like a great kid and I'm sure you're really proud of him. As for work/life balance I haven't really managed it so well myself and I plan to retire in a couple of years. I always seem to take on more than I can manage, but it always seems to get done anyway. I just get really crabby when faced with looming deadlines. My oldest daughter is the same way and she just had her first book published (from her PhD dissertation) a few weeks ago. Now she's writing a textbook and every time I talk to her she's stressing about "not enough time in the day to write, teach, prepare syllabi, etc." it's just the human condition, I guess. Susan, fantastic beginning!!! And I love Vera! So glad to know we will see more of her. What wonderful atmosphere you created in that scene. And chills! Can't wait to read the rest!! As for the balancing thing, I am probably not the person to ask. If I were better at it, I might actually finish a book a year, and not have spent the last five months doing nothing but working. Now I'm so far behind on everything else, I'll get caught up in doing all those untended to things and get a late start on the NEXT book! Vowing to be better. I have lived by my daily planner the last few months. It does seem to help. Oh,PS, I love crepuscular, too!! I agree with whoever said "make a list." That is how I survived working and mothering two boys and a husband. I love the Maggie Hope series and am So glad to hear that there will be at least two more books in the series. I am now reading Hank's Jane Ryland series and as a journalism school graduate (many years ago) I am really enjoying it. It's always a push/pull. But being with your family is so important , even if you were writing too. Your kids will always remember your presence. Love Maggie Hope...smart woman character. Thanks for the excerpt ! I commend your efforts to achieve a work/life balance, and applaud the results in your writing. Wonderful use of setting to get us into both plot and character. I was captured immediately. This book is now on my wish list. Wouldn't have known about it otherwise! Well, I'm a Gemini, so I don't feel torn until there's at least three directions...But seriously, there is nothing to do but take action. Find the one thing you can do right now, and do it, or at least do something towards that goal. Or, if there's nothing you can do at this minute (I'm often pondering these things at 2am), then simply let the worries drop away and be in the moment. Sleep if it's night, drink if it's five! I loved the prologue...looking forward to the book. Eagerly waiting to read The Queen's Accomplice. I'm a big fan of the series. I work in a library and friends are always asking me for book recommendations. I enthusiastically suggest the Maggie Hope series. Everyone I know who has started the series has loved it as much as I do. The prologue is fantastic. I love how the mood is set in just a few paragraphs. I can't wait to find out how Maggie gets involved with Vera and a very sinister sounding plot. To address your query regarding finding balance, I think it is an issue that everyone struggles with at some point. I try to focus only on work when at work and only my family when I am at home so each has my full attention for that part of the day. However, we have all those days where work life creeps into home life or home life creeps into work life. We make the best decisions that we can in those moments. On those days, I do try and take a moment to think about something I'm grateful for in the middle of the chaos to help keep myself centered as I tackle whatever problem is in front of me. Best of luck to you. Thanks for sharing Susan. I do love historical fiction mysteries. I've also been enjoying the Jacqueline Winspeat & Frances Brody's series as well. This book really hits home with me. The Holocaust stabs me deeply with intense sorrow. As a Jew, I am always drawn to these types of story lines. We can never forget. Thank you, Susan, for writing this enthralling thriller. I cannot wait to get my trembling hands on it. How exciting to see a new Maggie adventure is coming. Even if I don't win the ARC I'm happy just know what awaits when the new title is published. As always, I can hardly wait for your new book. I'm counting down the days. Reading the excerpt only makes the waiting more difficult. Each of your books is better than the previous one. I wish you success with THE QUEEN'S ACCOMPLICE. To respond to the points you brought in your blog post, the work/life is balance. I can sympathize completely. I work full time and my parents have health issues, so it makes it difficult trying to squeeze in the time to write. I can only write in the evenings when I come home from work and on the weekends. But I try to be disciplined about it. That because writing is my passion and it's been my dream since I was nine years old. If you want something very much and work hard, in the end things will fall into place. It may not be how you anticipated it would turn out, but it happens. You'll always feel like you're being pulled in two different directions, but don't feel guilty. You can't be everywhere all the time. You just have to direct energies in the task you're dealing with at that moment, otherwise you'll drive yourself insane. Believe me, I know. I think you're doing a wonderful job-at everything. Great read. I have just finished the first book of the Maggie Hope series and looking forward to reading the rest. I loved the insight into Winston Churchill (fiction or could be). Having visited the War Rooms, I really thought about what I saw and how they must have lived during that time. On to your great question. You can only try to compromise. Choose what is MOST important and follow your direction. You sometimes just have to make a choice and live with your decision. Or depending on the situation, split your time if you can and give to both equally. Not an easy question! Our last dog always wanted to drive. We are currently on vacation. I am sitting here writing a reply to this blog instead of out vacationing because my husband has work to do for a job he is doing next month. Although I'm only slightly involved in this particular job, as his partner I will need to proof his work - second pair of eyes thing. When we schedule our time we schedule in the work-time. And if a call or an email from a client comes in we change the schedule if we have to. When you run your own business, that's the way it has to be. I am SO looking forward to the new Maggie Hope. Thanks for whetting my appetite. Another Maggie Hope! Can't wait....and love having "inside knowledge" that Vera convinced you to keep her on :). Work/Life balance issues are a thing of the past for me as I am retired but count on my list making more than ever.....what used to be entered reliably into my brain, now needs to be firmly captured on paper as well.....and the act of crossing off completed items brings sweet satisfaction :). What joy your boy must bring you as he takes on the world with his enthusiasm....so much to look forward to for him! Aw....youth and their excitement for life! Fun!! October can't get here soon enough! I have recently read the Maggie Hope mysteries and have fallen under Maggie's spell. Love Maggie and the history surrounding her mysteries. I was recently introduced to the Maggie series.I would love to win this copy. I am torn between living in KY and getting over an illness and not being time in SC with my 90 & 91 year old parents. The are well and amazing; my daughter is with them. I would love to spend more time there,also. Thanks for the offer.